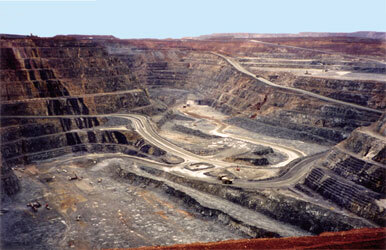 Image: Section of the Kalgoorlie Super Pit, Western Australia. Porter GeoConsultancy, continued its International Study Tour series of professional development courses during November 2011 by visiting a representative selection of the major gold deposits and ore styles across Australia. The tour commenced during the mid-afternoon of Sunday 13 November 2011, in Sydney, New South Wales, and ended in Perth, Western Australia on the morning of Sunday 20 November. Participants were able to take any 2 or more days, up to the full tour, as suited their interests or availability, with participants joining and leaving the tour at appropiate locations along the route. 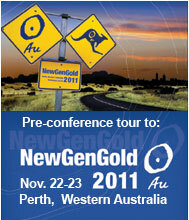 This was a technical tour to precede the major NewGenGold 2011 Conference held in Perth, Western Australia from the evening of 21 to 23 November, 2011. The Boddington gold-copper deposit is one of the largest gold producers in Australia. It is located 13 km WNW of the township of Boddington, and 95 km SE of Perth in Western Australia (#Location: 32° 44' 50"S, 116° 54' 19"E). The deposit lies within the northern half of the small Saddleback greenstone belt in the South West Terrane of the Archean Yilgarn craton. It also falls within the southern section of the Darling Plateau bauxite province that includes a cluster of large bauxite deposits, several of which overlie the Saddleback greenstone belt. Gold mineralisation has been exploited at Boddington in two major phases. The first was between 1986 and 2001, mainly from the bauxitic laterite and saprolitic profile, complemented by underground high grade, hard rock, lode ore from the Jarrah quartz veins. The second phase of mining commenced in 2009 and continues to the present, exploiting the large, hard-rock Wandoo deposit within the underlying greenstone basement. The Saddleback greenstone belt was first recognised in 1976 (Wilde, 1976) during regional mapping by the Geological Survey of Western Australia (GSWA). A program of stream sediment and follow-up soil and rock sampling by the GSWA in 1978 over sections of the greenstone belt returned anomalous values of Au (up to 1.6 ppm), As, Cu, Pb, Mo and Zn (Davy, 1979). These results encouraged Reynolds Australia Mines Pty Ltd to undertake a program of surface laterite sampling for gold in 1980, and selected re-assaying of vacuum drill holes for gold from a bauxite program conducted over the area by Alwest Pty. Ltd. in 1977 and 1978. This resulted in the estimation of a resource of 15 Mt @ 2.77 g/t Au by 1981, followed from 1981 to 1984 by a 50 x 50 m program of reverse circulation core drilling to bedrock, outlining a pre-JORC recoverable reserve of ore and marginal ore of 45.1 Mt @ 1.80 g/t Au in 1984 (Symons et al., 1990). Mining commenced in 1986 at a rate of 3 Mtpa, with the first gold pour in July (Collings and El Ansary, 1987). The bulk of the ore mined was in clay, which did not require blasting. Worsley Alumina Pty Ltd, who also operated the nearby Boddington Bauxite Mine, managed the Boddington Gold Mine on behalf of a joint venture between Reynolds Australia Alumina Ltd (40%), the Shell Company of Australia Ltd (30%), BHP Minerals Ltd (20%) and Kobe Alumina Associates (Australia) Pty Ltd (10%). By 1994, after a series of corporate divestments, amalgamations and asset sales, the partners were Normandy Poseidon (44.44%), Acacia Resources (33.33%) and Newcrest Mining (22.23%). The Hedges Gold Mine exploited the northwestern section of the oxide deposit on the Alcoa of Australia bauxite mining leases from 1988 at a rate of 2 Mtpa, operating separately until purchased by the Boddington Gold Mine partners in 1998. In 1990, the high grade Jarrah Quartz Veins were discovered and put into production through mining at the bottom of the laterite pit and as an underground decline operation, to recover 9.3 tonnes of gold between October 1992 and March 1997. Mining was suspended on 30 November 2001 after the known oxide ore resource had been processed and ~189 tonnes of gold and 6500 tonnes of copper had been recovered from ~134 Mt of oxide and ~5 Mt of ‘hard rock’ ore from Hedges and Boddington (Newmont staff, pers. com. 2011). The lateritic orebody was mined by selective open cut methods over an area of 4.5 x 1 km. Gold was extracted by a carbon in leach processing, with an average metallurgical recovery of 95% (Symons et al., 1990). Although the laterite resource had been depleted, the presence of low grade basement mineralisation had been known since the late 1980s, and a program to define and develop the hard rock Wandoo resource had been initiated in 1994 and was ongoing in 2001. Newmont acquired Normandy Mining Limited in 2002, then the Newcrest share of the joint venture in 2006. AngloGold had merged with Acacia Resources in late 1999, and sold its Boddington interest to Newmont in 2009, who then became the sole owner of the operation. Testing over this period had progressively enlarged the resource, which by 31 December 2009, totalled a proved + probable reserve of 875 Mt @ 0.75 g/t Au, 0.11% Cu, for 650 tonnes of contained gold with an estimated metallurgical recovery of 82% (Newmont 2009 Reserves and Non-Reserve Mineralization report). Following a positive feasibility study, Newmont commenced the second phase of mining in 2009 as two major open pits over a length of 3.75 km within the earlier laterite pit, with the first gold poured in November of that year. The current mill capacity of the operation is 39 Mtpa. Remaining reserves and resources are outlined below. The Boddington Au-Cu mine and Saddleback greenstone belt are located within the Archean South West terrane, which covers an area of ~100 000 km2, and was amalgamated with the adjacent Youanmi terrane at ~2.65 Ga (Cassidy et al., 2006). It is characterised by a paucity of preserved greenstone belts compared to adjacent terranes of the Yilgarn craton, and those that are known, are comparatively small. The South West terrane is predominantly composed of granitic rocks, the majority of which are divided into five main overlapping suites based on geochemical characteristics, emplaced between 2.75 and 2.62 Ga with a volumetrically smaller group dated at 2.85 to 2.70 Ga (Qiu and McNaughton, 1999). The bulk of these granitic rocks are younger than 2.69 Ga, and mainly comprise monzogranite, granodiorite and alkali feldspar granites. The younger granitoids were emplaced between 2648 and 2626, with continued cooling and Pb loss from zircons, from 2628 to 2616 Ma. Post-tectonic, ~2580 Ma granitoids also occur towards the eastern margin of the terrane (Wilde et al., 1996; Nemchin and Pidgeon, 1997). Extensive granulite facies metamorphism with associated migmatite and charnockitic granites were formed between ~2.64 and 2.62 Ga producing a series of high-grade metamorphic domains. The most significant are the Balingup and Jimperding metamorphic belts. An extensive, but irregular, corridor of granitic gneiss and migmatites, with associated small layered mafic intrusions, continues SE from the latter to the southern edge of the Yilgarn Craton. These metamorphic domains appear to be related to broad zones of shallow, west-vergent, thrusting (Wilde et al., 1996). Supracrustal sequences are mainly represented by 3.2 to 2.8 Ga quartz-feldspar-biotite gneisses that are predominantly after siliciclastic and chemically-precipitated metasedimentary rocks protoliths and orthoquartzites (Cassidy et al., 2006). These sequences generally predate the granitoids and are mostly preserved within extensive zones of granulites, migmatites and granite gneisses, particularly within the cores of the Balingup and Jimperding metamorphic belts. Preserved greenstone belts are limited in extent and number, and have a range of ages. In the west, the Wongan Hills greenstone belt to the north has been dated at ~3.01 to 2.82 Ga, similar to the metasedimentary gneisses, and comprises mafic and felsic volcanic rocks, chert, BIF and small ultramafic intrusions. The Morangup and Saddleback greenstone belts are younger, composed of basaltic, intermediate and lesser felsic volcanic rocks, ultramafic dykes and granitoids emplaced between 2714 and 2612 Ma. Both are partially fringed by granulites and older metasedimentary gneisses. The latter are interpreted to represent older sialic basement onto which the greenstone belt rocks have been emplaced. Both are otherwise truncated by younger granitoids (Wilde et al., 1996). The main Saddleback greenstone belt (SGB) trends NNW-SSE over a strike length of 42 km. It is straddled by two major late shear zones, with a width that is generally ~6 km, but is up to 8.75 km in the southern half. Gravity data indicates that the vertical thickness of the belt increases from around 1 km in the vicinity of Boddington Gold Mine, to over 4 km in the south of the SGB. It is enclosed by younger granites in the northern section, but to the south has contacts with both older metasedimentary gneisses and with granulite gneisses and migmatites. Wilde (1976) observed both faulted and intrusive contacts defining the outer margin of the SGB. Wilde (1976) divided the sequence within the SGB into three units. The first is the Hotham Formation, which is restricted to a 3 km2 triangular area on the south-eastern margin of the SGB, and is largely composed of meta-sedimentary rocks. The sequence comprises with a suite of quartz-mica schist, meta-siltstone, meta-tuff and fine-grained meta-greywacke, followed to the east by the dominant meta-siltstones with a few thin bands of agglomerate, which in turn, passes conformably via a transitional boundary into the volcanic rocks of the Wells Formation. The Wells Formation, which is ~5500 m thick in the Boddington Gold Mine area, comprises interfingering andesitic, dacitic and rhyodacitic lavas, porphyritic lavas, tuffs, breccias, agglomerates and minor sedimentary rocks, all of which are variously deformed and metamorphosed. In general, lavas are more abundant in the north whilst pyroclastic rocks predominate in the southern half of the SGB. Relatively thick bands of dacite and andesite have been differentiated in mapping towards the northeast, hosting the ore deposit. This formation corresponds to the interleaved basaltic, intermediate to felsic, dacitic and andesitic volcanic lithofacies divisions shown on the accompanying image. The Marradong Formation is 3000 to 8000 m thick and dominated by meta-basaltic rocks with only minor dark metasedimentary intercalations and rare bands of more evolved volcanic lithologies. The contact with the Wells Formation is reasonably abrupt and conformable, although thin bands and lenses of meta-dacite occur within the western basaltic rocks close to the contact. Laterite cover of this formation is almost complete and as a consequence exposure is poor. Within the northern SGB, the Wells and Marradong formations are cut by shallow granitoid plutons which include weakly to strongly porphyritic diorite and microdiorite, monzodiorite, quartz-diorite, granodiorite and tonalite, as well as ultramafic dykes and late monzogranite. According to Allibone et al. 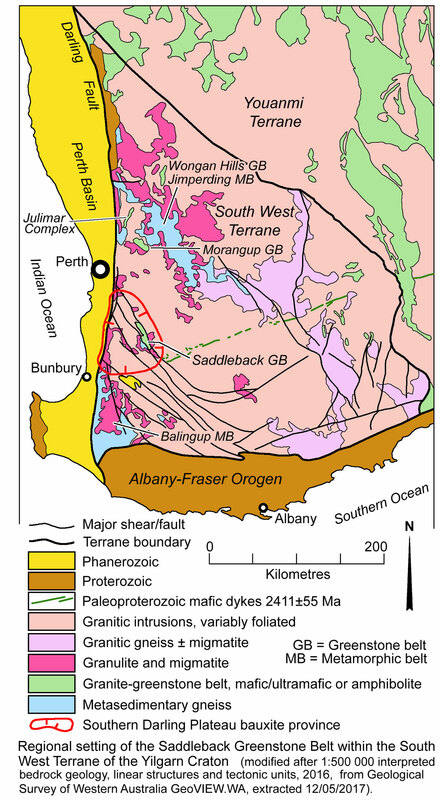 (1998), geologic mapping and radiometric dating in the Boddington Gold Mine area suggest the Wells and Marradong Formations, and associated intrusions, are the result of at least five discrete Archean magmatic events, two of which are apparent within the Wells Formation, suggesting a temporal break within that sequence. These are as follows: (i) From ~2714 to 2696 Ma, indicated by intrusive monzodiorite to granodiorite dated at 2714±2 and 2696±4 Ma in the central Boddington Gold Mine, intruding host volcanic rocks of the Wells Formation, which must therefore fall within the same age range or be older; (ii) Between ~2696 and 2675 Ma, represented by a set of NNW trending peridotite-pyroxenite-dolerite to gabbroic dykes that may be up to a few tens of metres thick; (iii) At ~2675 Ma, when a second suite of intermediate to basaltic volcanic and volcaniclastic rocks were deposited to the north and east of the deposit, visually indistinguishable from the earlier suite, accompanied by coeval granodiorite-tonalite intrusions; (iv) Numerous pyroxenite dykes that cut rocks from all three previous events, but predate the fifth; (v) ~2612 Ma, represented by the un-mineralised Wourahming monzogranite to the northeast of the Boddington Gold Mine, cutting rocks associated with all previous events. This intrusion is distinct in terms of its texture, magnetic signature, radiometric signature and age. All of these magmatic rocks are cut by at least three generations of Proterozoic dolerite dykes that are locally up to 80 m thick. Wilde (1976) mapped the Marradong, Wells and Hotham formations as three time stratigraphic units younging to the NE. However, McCuaig et al. (2001) suggest the Marradong Formation is the oldest, temporally overlapping the Wells Formation, both formed during the ~2714 to 2696 Ma magmatic event, whilst the 2675 event also contributed to the Wells Formation, and the Hotham formation post-dates both. Three generations of NNW to NW striking ductile shear zones are recognised in the Boddington Gold Mine area, each characterised by a distinct mineral assemblage and an incipient to strongly developed foliation, generally subparallel to the primary lithologic layering. D1 and D2 are both indicated to have northeast-side up, dominantly dip-slip displacement and are separated by the first pulse of ultramafic dykes, whilst D3 postdates the ~2675 Ma magmatic event. A fourth deformation D4, produced numerous narrow WSW oriented brittle faults that accompanied emplacement of the second generation of ultramafic dykes and cut all the rocks emplaced at or before -2675 Ma. This set of parallel, en echelon D4 faults are restricted to a kilometre-wide, generally NW-SE elongated rectangular zone in the core part of the Boddington Gold Mine. It also reactivated D1/D2 structures (Allibone et al., 1998). Mineral assemblages within the SGB rocks indicate metamorphism to upper greenschist and lower amphibolite facies under relatively low-pressure conditions between 2650 and 2630 Ma, in contrast to the granulite facies of the enclosing older rocks framing the SGB in the south. The regolith at the Boddington Gold Mine was developed by in situ weathering of Archean bedrock, with only minor transport of the residuum. It is divided into upper laterite and lower saprolite zones that are 2 to 15 and 25 to 80 m thick respectively, separated by a 1 to 5 m thick transitional ferruginous clay zone. From the surface, the laterite zone comprises 1 to 10 m of topsoil and loose gravel, which includes nodules and pisoliths of hematite and maghemite. These are underlain by 1 to 2 m of ferruginous duricrust which forms an almost continuous blanket over large areas and may be either pisolitic or fragmental. The latter contains fragments from a few mm to >30 mm across in a matrix of gibbsite and goethite. The underlying B-zone forms the base of the laterite profile and comprises a yellow-brown gibbsitic bauxite with goethite, hematite and minor kaolinite. It varies from 1 to 10 but averages ~4 m in thickness, is locally mottled and contains patches of saprolite and incipient nodules. The underlying saprolite is 25 to 80 m thick, and ranges from white to multi-coloured, mottled and ferruginous kaolinitic clays, frequently with preserved rock textures and less destructive and very varied weathering in contrast to the laterite zone. There is a relatively abrupt saprock transition over a few metres into bedrock. The saprock is characterised by green smectitic clays, with rock fragments and well preserved textures. This interval is characterised by its retention of essentially all alkali elements (Symons et al., 1990; Anand, 2005; Collings and El-Ansary, 1987). Bauxite mineralisation is hosted by the lateritic gravels, duricrust and B-zone. A semi-continuous blanket of gold mineralisation within the duricrust, B-zone laterites and in the underlying ferruginous clay zone accounts for ~30% of the gold in the regolith. This blanket has relative homogeneity and apparent continuity over lateral distances of hundreds of metres. The overlying lateritic gravels contained only anomalous, but not economic, concentrations of gold, and were generally discarded as overburden (Symons et al., 1990). Within the laterite zone, gold occurs in intimate association with iron and aluminium hydroxides, and was precipitated at a redox front at or near the Tertiary water table, whilst gold is depleted from the upper duricrust, suggesting ongoing leaching. Gold occurs as discrete grains, usually from 1 to 10 µm in diameter, with a fineness of >990 (Symons et al., 1990). The remaining 70% of the gold in the regolith is hosted within the saprolitic clay and saprock zones. In contrast to the laterite zone, gold in the saprolite clays is relatively inhomogenous and has poorer continuity. It occurs in primary quartz veins, in clays immediately adjacent to mineralised quartz veins, and in secondary, shallow dipping, goethitic horizons. The latter are interpreted to represent precipitation at paleo-water tables. However, clays with little or no quartz or ferruginisation may also be well mineralised (Symons et al., 1990). Symons et al. (1990) noted that, whilst concentrations of secondary gold in shallow dipping goethitic horizons are locally dominant, detailed sampling confirms that the distribution of gold within the clay zone essentially reflects a primary control. As such remobilization due to weathering is less marked than in the laterite zone. In the saprock zone, the distribution of gold mineralisation is closely related to primary basement mineralisation. 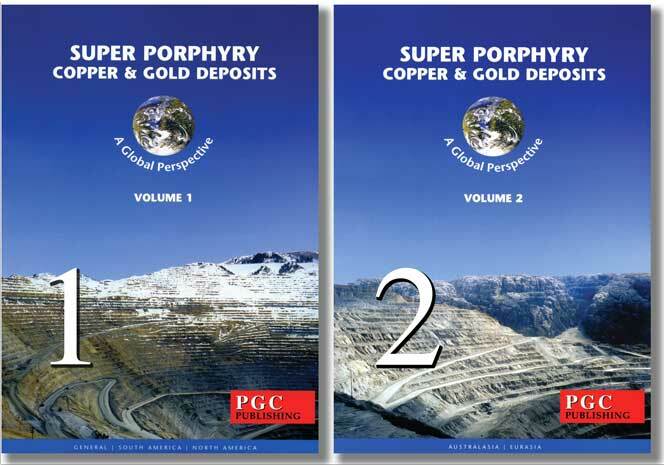 Supergene gold-copper-silver mineralisation has also been recorded in the saprock zone, with a downward zoning of copper minerals from malachite through cuprite, native copper and chalcocite to primary sulphides, principally chalcopyrite (Symons et al., 1990). 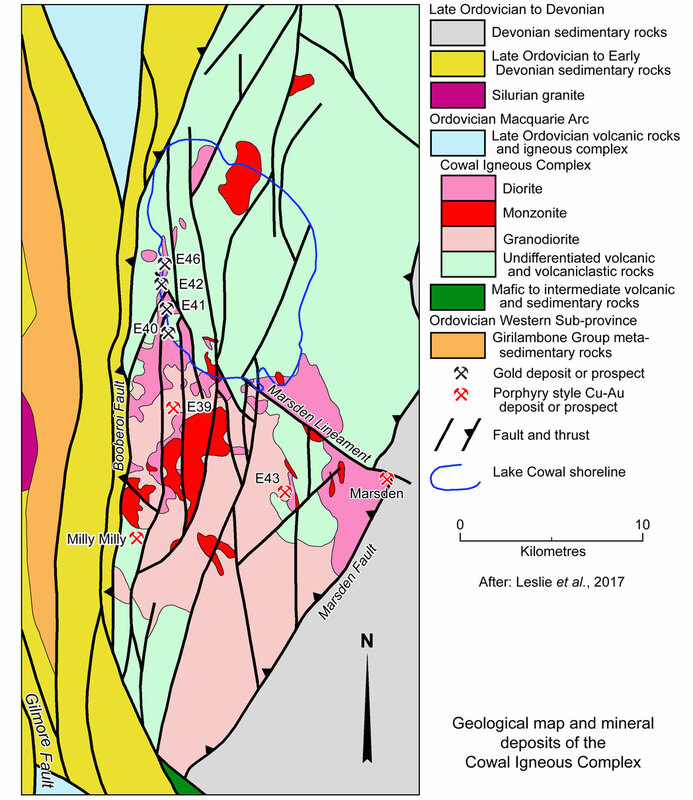 The bulk of the oxide mineralisation directly overlies a complex of stockwork veining and incipient hydrothermal alteration which covers an area of >25 km2 within the SGB, centered on the late, barren, ~2612 Ma, Wourahming monzogranite. The highest concentration of veining, which encloses the Wandoo deposit, is found to the west of this monzogranite. It occurs within a kilometre-wide package of sheared andesitic and dacitic volcanic and dioritic intrusive rocks focused on the exposed western cusp of a large composite diorite stock, the upper sections of which are sporadically exposed over an area of 15 km2. The core of the composite stock comprises medium-grained aphyric diorite intruded by variably quartz-feldspar porphyritic diorites, and then by a later-stage, blue-quartz ptygmatic-veined quartz diorite. The Wandoo deposit comprises two main, NW-SE elongated resource shells that are ~2 x 1 and 2 x 0.7 to 1 km to the SE and NW respectively within the corridor of strong veining, separated by a 500 m wide gap. These shells are further divided into at least eight domains based on lithology and grade. Mineralisation is inhomogeneous, with localised concentrations of from >1 to 19 g/t Au in veins, lenses and stock-works. It is characterised by a reduced assemblage, with chalcopyrite and pyrrhotite the dominant sulphides, and minor pyrite, sphalerite, cubanite, cobaltite, arsenopyrite and pentlandite. Molybdenite is locally a major mineral throughout the deposit. There is a strong correlation of Cu, Au, Mo, Bi and W in the core of the mineralised system, with Pb, Zn and Ag enriched on the periphery (Kalleske, 2010). McCuaig et al. (2001) recognised two stages of mineralisation at Boddington, supported by age dating of associated molybdenite by Stein et al. (2001). The earliest is associated with the pre-2696 Ma diorite intrusion, and is accompanied by extensive silica-biotite alteration, occurring as complex quartz+albite+molybdenite±clinozoisite±chalcopyrite±gold veins variably deformed by D1 ductile shearing. Re-Os ages from molybdenite in these veins indicates a formation age of ~2700 Ma. Subsequently, a ductile D1/D2 event was accompanied by silica-sericite-pyrite alteration, whilst ductile D3 shear zones produced mylonite zones with silica-albite-epidote-pyrite alteration. McCuaig et al. (2001) observed the second and main stage of mineralisation post-dated all of the magmatic events, with the exception of the late 2612 Ma monzogranite, and accompanied the D4 brittle deformation. It has been divided into the following paragenesis: (i) complex quartz+albite+molybdenite±muscovite±biotite± fluorite±clinozoisite±chalcopyrite veins, comprising the main late Mo stage; (ii) Clinozoisite-sulphide-quartz-biotite veining containing the bulk of the low-grade skarn altered Au-Cu mineralisation; (iii) Actinolite±sulphide±quartz, carbonate-chlorite-sulphide, and sulphide veins which constitutes the main high grade mineralisation. Re-Os dating of these mineral assemblages (Stein et al., 2001) return a weighted mean model age of 2615±9 Ma, broadly synchronous with the Wourahming monzogranite. Based on the integration of available geochemical and geological datsets, McCuaig et al. 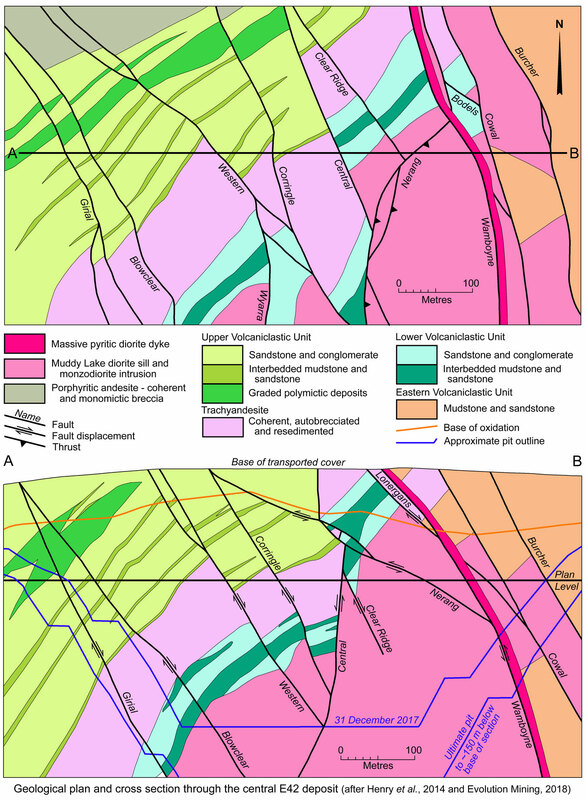 (2001) concluded that the main controls on ore were, in increasing order of importance: (i) The late ductile-brittle NW and WNW striking, subvertical D3-D4 fault network; (ii) Intersection of this fault network with structurally competent lithologies; (iii) Intersection of late faults with early ductile D1/D2 quartz-sericite shear zones. (4) NE-striking faults which compartmentalise the deposit and offset favourable host rocks pre-mineralisation. High grade vein accumulations also occur within, and external to, the Wandoo resource, such as the Jarrah veins on the northern extremity of the Boddington Gold Mine. This vein system was predominantly within andesitic and to a lesser degree, felsic tuffaceous fragmental rocks and dioritic intrusions, hosted by the Jarrah Shear, a 50 to 150 m wide zone of shearing and deformation of varying intensity and age. The shear contained folded, recrystallised, extensional quartz veins, crosscut by later, brecciated fault structures hosting gold and base metal sulphides. The Wandoo deposit is interpreted as a structurally-controlled, intrusion-related, Au-Cu deposit, formed by two overprinting magmatic-hydrothermal systems. The first has ‘porphyry-like’ characteristics, associated with dioritic intrusion at ~2700 Ma, the other coeval with a barren post-tectonic granitoid at ~2612 Ma. Although gold is associated with both events, the main stage, particularly the high-grade mineralisation, appears synchronous with the latter (McCuaig et al., 2001). Inferred Resource - 232 Mt @ 0.80 g/t Au, 0.09% Cu, for 185 t Au. Inferred Resource - 292.9 Mt @ 0.5 g/t Au, 0.11% Cu, for 146 t Au. Inferred Resource - 7.5 Mt @ 0.58 g/t Au, 0.11% Cu, for 4.35 t Au. TOTAL Resource - 361.7 Mt @ 0.76 g/t Au, 0.11% Cu, for 275 t Au. The Kalgoorlie Gold Field is developed within the Archaean Norseman-Wiluna greenstone belt of the Eastern Goldfields province in the eastern Yilgarn craton. It is hosted by greenschist facies, marine volcano-sedimentary rocks, divided into narrow blocks by NNW-trending regional wrench faults. The volcanic succession comprises, from oldest to youngest: (1) the Lunnon Basalt (~2720 Ma) - pillowed to massive tholeiitic lavas; (2) Kambalda Komatiite (2709±4 Ma) - ultramafic flows; and (3) Devon Consols and Paringa Basalts - two pillowed to massive magnesian lavas, separated by the 10 m thick, 2692±4 Ma, Kapai Slate marker horizon of sulphidic and tuffaceous shale. This volcanic succession is overlain by black shales, greywackes, and volcaniclastic rocks of the Black Flag Group. To the south of Kalgoorlie, near Kambalda, this latter unit is intruded by the 2680±8 Ma Condenser Dolerite sill and 2678±8 Ma rhyolite porphyry dykes. In the Kalgoorlie district it is intruded by the 750 m thick Golden Mile Dolerite, which is the principal host rock to lode structures, and comprises a folded and metamorphosed, differentiated sill, emplaced at the same stratigraphic position as the Condensor Dolerite. The youngest mineralised rocks in all gold mines located between Kalgoorlie and Kambalda are 2675 to 2660 Ma stocks and dykes of hornblende-plagioclase porphyry. Deformation of the volcano-sedimentary succession in the Kalgoorlie-Kambalda area was subdivided by Swager (1989) into four events: D1, characterised by recumbent folding and nappe-style thrusting; D2, which comprises upright folding that produced regional northwest-trending folds; D3, a post ~2660 Ma episode of sinistral wrench faulting in a transpressional regime, with major NNW-trending faults; and D4 which involved dextral wrench faulting, mostly NNE-trending. 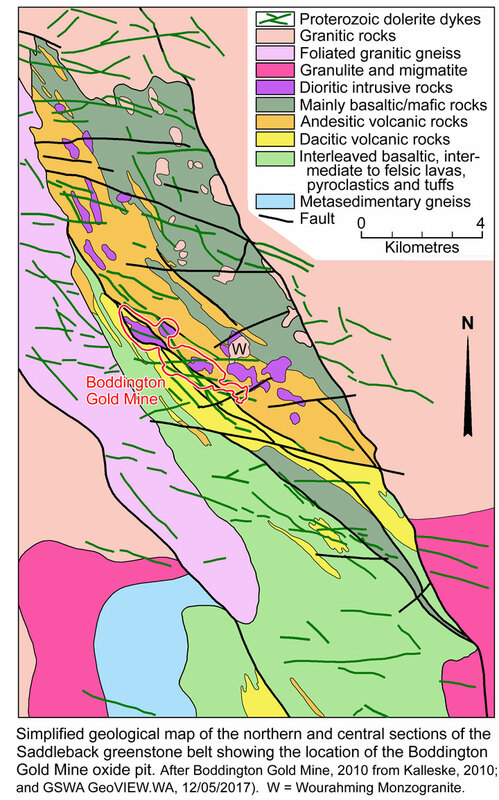 The Kalgoorlie Gold Field comprises more than 1000 discrete lodes, controlled by brittle-ductile shear zones, clustered in a geometric array on both sides of the steeply dipping, NW to NNW-trending, sinsitral Golden Mile fault, which transects folded Golden Mile Dolerite in the centre of the mining district. The most significant of the lodes make up the Golden Mile, Mt Charlotte, Mt Percy and Hannan's South ore zones. An envelope of chlorite-calcite alteration, surrounds the entire mining area, replacing metamorphic actinolite and albite in all mafic rocks. The main lode systems are contained within a volume of these altered rocks, which is up to 5 km in length, by 1 to 2 km in width, and to a depth of 1000 m. They are controlled by a complex series of steeply dipping shears, and are largely hosted by ultra-mafic and mafic rocks and sills, the most important of which is the composite mafic sill, the Golden Mile Dolerite, and to a lesser extent the Paringa Basalt. Two groups of structures, the Fimiston and Oroya lodes have been recognised. The Fimiston Lodes occur in steeply dipping (70 to 90°) shear zones, commonly parallel to the main Golden Mile fault, although others have different strike orientations. Individual lodes are up to 2 km long by 1.3 km in vertical extent, with high-grade shoots located at the intersections of shear zones. They are characterised by breccia bodies and cavity-fill veins surrounded by (1) an inner sericite-ankerite-siderite-quartz-hematite-pyrite±telluride alteration zone, containing most of the gold, and (2) an outer ankerite-sericite-quartz-pyrite zone where chlorite and calcite are progressively replaced. The ores are mineralogically refractory and complex, containing free native gold (often intimately associated with gold-bearing arsenical pyrite) and a significant proportion of Au-Ag-Hg-Pb telluride minerals. These Fimiston Lodes are subdivided into the Eastern and Western Lode System on the flanks of the Kalgoorlie Syncline. The Eastern Lodes System comprises a swarm of lodes (areas of pyritic and hydrothermal alteration) with mineralisation confined to shoots at lode-lode and lode-fault intersections. The Western Lode System is less complex, although the lodes are more persistent and well defined. Individual lodes occupy 20 to 50% of a lode channel and may be 30 to 1800 m long, 0.1 to 10 m thick and extend 30 to 1160 metres down dip. Mueller et al. (1988) suggest that the Fimiston Lode shear zones formed during D3 sinistral wrench faulting, whereas Bateman et al. (2001a) and Bateman and Hagemann (2004) conclude that the mineralised shear zones formed as flat, late D1 thrusting structures, subsequently rotated into their present subvertical position during D2 folding. The Oroya Lodes represent the high-grade "green leader" ores, characterised by green vanadian muscovite, ankerite, quartz, pyrite, native gold, and gold-silver tellurides, the principal example of which is the 1500 m long Oroya shoot on the Paringa mine leases of the Golden Mile. This lode is controlled in large part by the 50°W dipping, reverse Oroya shear zone system. This style of ore also occurs in the brecciated cores of steeply dipping Fimiston lodes, and may represent a late-stage of the D3 transpressional regime that generated the Fimiston lodes (Mueller et al., 1988), or a separate mineralisation event (Bateman et al., 2001). Mount Charlotte occurs as a quartz vein gold deposit, present as a series of steeply plunging, pipe-like vein stockwork orebodies in massive 2692±2 and 2678 to 2670 Ma metagabbro of the Golden Mile Dolerite. These, and other related quartz-vein stockworks cross-cut the Fimiston and Oroya lodes, and are apparently controlled by district-scale NNE-trending strike-slip D4 faults. The Mt Charlotte mine exploits the main Charlotte and Reward orebodies and the satellite Maritana and Northern bodies. The Charlotte orebody extends more than 800 m vertically, from the surface to -1000 m RL, 250 m north-south along strike and over a width of 50 to100 m east-west. Reward extends from the surface to -800 m RL, 250 m north-south along strike and 50 m east-west. The orebodies are restricted to the most differentiated (and competent) unit of the host sill and are usually found adjacent to major steeply dipping faults where these cut the sill. The stockworks have two sets of veins that were developed as hydraulic fractures and were filled simultaneously and are of equal significance. Gold is in pyrite or pyrrhotite bearing metagabbro around the stockwork veins and to a lesser degree as free gold in the veins and along vein margins. The final 'Super Pit' open pit is designed (as of 2008) to have dimensions of 3.8 x 1.35 km and a depth of 500 m below the surface by 2018. Production in 2006 was 85 Mt of mined rock, 12 Mt of which was milled. The remaining tonnage was stockpiled low grade mineralisation and waste. In 2007, the underground Mt Charlotte mine produced 1 Mt of ore @ 3 g/t Au. Total production from 1893 to 2005 was ~1475 t Au (47.5 Moz), with a further ~110 t from 2005 to 2010. Inferred resource - 2.24 Mt @ 4.47 g/t Au, for 10 t Au. The Kalgoorlie Super Pit open pit and Mt Charlotte underground operations are owned by KCGM, a 50:50 JV between Newmont Mining and Barrick Australia. Production in 2010 totalled approximately 24.5 t of recovered Au (Barrick and Newmont, 2011). The Sunrise Dam operation is approximately 55 km to the south of Laverton, 220 km NNE of Kalgoorlie, and 770 km NE of Perth, in the Eastern Goldfields province of the Archaean Yilgarn craton, in Western Australia. The deposit originally straddled the title boundary between the AngloGold Ashanti Ltd Cleo mine and the adjacent Sunrise leases of the Placer Pacific Granny Smith operation, (see the Granny Smith record), with the pits of the two operations overlapping. AngloGold Ashanti subsequently took control of the complete deposit. The ore at the ~2670 Ma Sunrise Dam deposit is developed within both Archaean basement and the overlying transported cover. 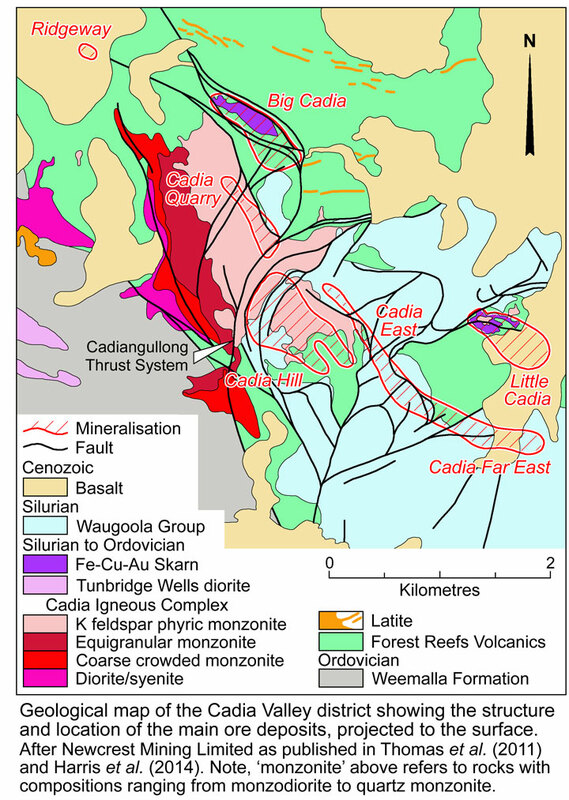 The basement ore lies within the Laverton Tectonic Zone of the Yilgarn craton, characterised by major north-south shears and associated faults. The dominant host is strongly deformed, greenschist facies andesitic to basaltic/mafic-ultramafic volcaniclastic rocks and magnetite-rich shales and turbidites (banded iron formation), which have been intruded by both quartz-feldspar porphyry sills and dykes (e.g., Dolly porphyry) and localised ultramafic and lamprophyre dykes. The timing of gold mineralisation relative to the metamorphic peak has not been ascertained, although similar deposits elsewhere in the Yilgarn craton are inferred to have formed syn- to post- peak metamorphism. Gold mineralisation is found intermittently within a NE trending corridor over a length of 4.5 km, coincident with a strongly magnetic BIF rich sequence. Group I orebodies, which occur in shallowly dipping foliation parallel veins within a strong penetrative fabric that consists of a sericite±chlorite cleavage and/or schistosity. Veins typically contain quartz-carbonate±pyrite±arsenopyrite and quartz-sericite-carbonate-pyrite-chlorite alteration. Group II lodes are steeply dipping and characterised by steep veins and breccias up to a few metres in width. Breccias comprise angular clasts of sericite-altered host-rock volcanics up to several cms across, locally with jigsaw fits, set in a quartz and quartz-carbonate matrix. Veins may be up to 5 m wide, and consist of carbonate-pyrite-arsenopyrite-quartz. Gently NW-dipping, laminated quartz-carbonate veins containing gold, arsenical sulphides and tellurides are also observed within Group II orebodies, and are interpreted to have formed during D4 dextral normal faulting. Group III orebodies are hosted within steeply dipping stockwork breccia zones up to 20 m wide, and less commonly as vein zones. Stockwork veins commonly contain carbonate-chlorite-quartz±sericite±pyrite±arsenopyrite, with adjacent alteration typically consisting of sericite-quartz-pyrite-ankerite±arsenopyrite. The breccia is characterised by sericite-altered host-rock volcanics clasts and quartz and carbonate matrix. Group IV lodes are hosted within the quartz-feldspar Dolly porphyry, with mineralisation being typically arsenic rich, occurring and within steep narrow (0.2 to 0.5 cm wide) gold-bearing quartz-pyrite-arsenopyrite veins. D1 - formed several major shallow- to moderately dipping northwest-trending shear zones (Cleo, Margies, Mako, Sunrise, Midway-GQ, and Carey). These include low-angle ductile shear zones, characterised by a penetrative S1 fabric, mostly parallel to the structures, are up to 40 m wide, and are vertically stacked above one another. Steeply dipping shear zones are also interpreted as initial D1 structures that subsequently underwent D3 reactivation. D2 - produced north- and south-plunging upright folds with steep axial surfaces, in response to east-west to WNW-ESE shortening, and S2 cleavage which crenulates S1. No mineralisation is associated with D2 structures, although the bulk of the ore accompanied D3 and D4. D3 - characterised by thrusting along gently dipping D1 shear zones and sinistral shearing along steeply dipping structures, accompanied by Group I and II orebodies (see below) in the respective structures. Quartz-feldspar porphyries (e.g., the Dolly dyke) are interpreted to have intruded during late D2 to D3 and locally host narrow gold-bearing quartz-pyrite veins (Group IV orebodies). These quartz porphyries are deformed by D3 shear zones and cut by S3 fabrics. D4 - resulted in dextral faults as a response to NE-SW shortening accompanied by steeply dipping stockwork vein (D4a) and breccia systems (D4b) that comprise the Group III orebodies. D5 - produced strike-slip faults as a result of SE compression. D6 - characterised by dextral conjugate faults caused by east-west shortening. Neither D5 nor D6 structures are mineralised. In the transported cover, secondary (supergene) gold with extremely high gold grades was hosted by fluvial sediments within two distinct horizons, each of 2 to 12 m in thickness over a 600 x 200 m area and at a depth of from 5 to 40 m. These were developed near the base of Tertiary palaeochannels and horizontal blankets of mineralisation related to iron redox fronts and associated palaeo-water table. The ore below the unconformity is developed in both oxidised and fresh bedrock, occurring as a shallow west dipping zone covering a plan area of 1600 x 700 m, and extending to more than 700 m below the surface. In December 2000 the AngloGold Cleo resource totalled 40.8 Mt @ 3.39 g/t Au, while in December 1998 the Placer Dome Granny Smith section of the deposit had a resource of 11.3 Mt @ 3.2 g/t Au. Together these total more than 170 t of contained Au. Extensions of the ore at depth comprise the Sunrise Deeps discovery. Total production to 2010 was 149 t (4.8 Moz) of gold at an average grade of 4.2 g/t Au. Production in the year 2006 totalled 14.463 tonnes of Au and by 2010, 12.316 tonnes Au. The Telfer gold deposits are within the Paterson Tectonic Province, in the Great Sandy desert, 400 km ESE of Port Hedland, and 1000 km north of Kalgoorlie, in Western Australia (#Location: 21° 43' 18" S, 122° 12' 52" E). The first recorded indication of the Telfer deposit was the discovery in 1970 of extensive small, low relief quartz-limonite gossans and limonitic siltstones outcropping as pods along lithological contacts by an independent geologist prospecting for copper in the Paterson Range. These gossans were sampled, but were not assayed for gold, and no title was taken. In 1971, Day Dawn Minerals NL undertook a regional sampling program in the district, also without title. Although anomalous copper and gold values were obtained, they were not deemed sufficient to warrant further investigation in the remote location. 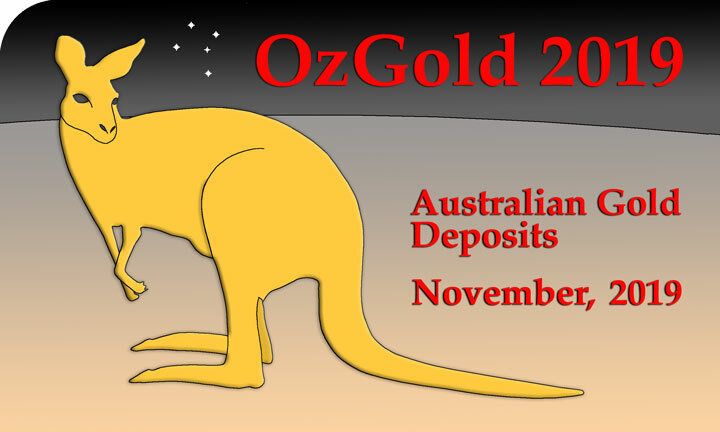 In mid 1972, Newmont Australia Limited, who were aware of both the original gossan discovery and the Day Dawn anomalies, visited and pegged title over the area. This was followed by sampling and then an intensive drilling program that by 1975 had defined an open pit reserve of 3.8 Mt @ 9.6 g/t Au, mainly of oxide ore. In 1975, BHP Gold Limited was introduced as a 30% joint venture partner in the project to satisfy Australian Government foreign ownership legislation. Later, in 1990, Newmont and BHP Gold merged their Australian assets to form Newcrest Mining Limited that assumed full ownership of the project. Mining commenced during 1975 at Main Dome and reached full production of 0.5 Mtpa in 1977. Ore processing was initially by milling, cyanidation and Merrill-Crowe gold recovery. During the early 1980s, exploration maintained the high grade reserve, although the potential for a large, low grade oxide resource in both Main and West domes was also recognised and by 1986 the crushing and grinding capacity was enlarged and the Merrill-Crowe process was replaced by a carbon in leach (CIL) circuit. A dump leach operation was commenced in 1988. By the late 1990s, Telfer was treating 2.5 Mtpa through the mill and CIL circuit, and 15 Mtpa of low-grade oxides by dump leach. In 1989, supergene-sulphide ore was being mined from the base of the oxide zone, initially from the open pit and in 1990, from underground. This required a sulphide flotation circuit to produce a copper and gold concentrate. By the late 1990s, 0.3 Mtpa of this ore was being treated. In 1991 surface exploration diamond drilling intersected the I30 quartz reef within the Main Dome at 1000 m below surface. A mining feasibility study was completed in 1995 and a decline was commenced that reached ~500 m below surface by July 1997. An underground drilling program ensued, followed by a study of how to best extract the series of deep high grade reefs that were discovered. This work outlined a high grade core reserve in the I30 Reef of 1 Mt @ 15.6 g/t Au, 2.6% Cu, surrounded by a larger tonnage, lower grade gold and copper stockwork. This was, in turn, was part of an even larger underground resource on the eastern limb of the Main Dome associated with an additional eight hanging wall and three footwall reefs, collectively known as Telfer Deeps. By 2000, the oxide resources were largely exhausted after extracting ~185 tonnes of gold, and mainly hypogene sulphide ore was being mined creating recovery and cost problems. As a consequence, operations were suspended pending feasibility studies into mining hypogene ore in the open pits and Telfer Deeps and modification of the flotation circuit of the existing sulphide treatment plant to accommodate the increased underground reserve and higher sulphide and copper content. In the meantime, the decline to the Telfer Deeps was deepened. The feasibility study was completed in 2002 and production recommenced in the open pits in 2004 and underground in 2006, based on reserves and resources of 320 Mt @ 1.4 g/t Au, 0.14% Cu and 444 Mt @ 1.4% Cu, 0.13% Cu respectively in the open pits and 39 Mt @ 2.7 g/t Au, 0.5% Cu and 59 Mt @ 2.8 g/t Au, 0.52% Cu respectively underground. Resources are inclusive of reserves. The main underground mining method was sub-level caving. Production has continued to the present with only minor operational pauses, for a cumulative total of >150 tonnes of recovered gold. Details in this section are largely drawn from Moorhead et al. 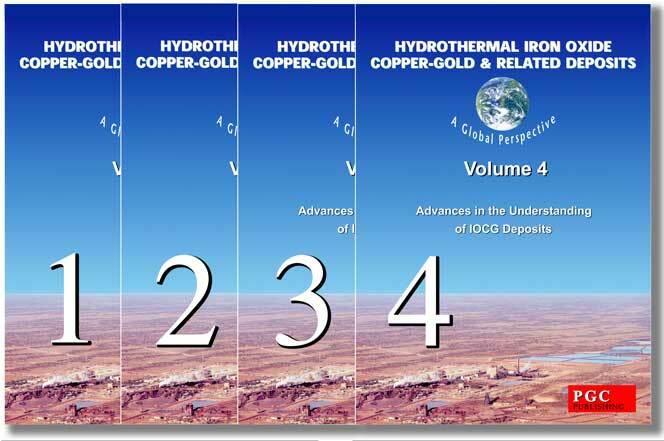 (2013) and Newcrest Mining annual reports and releases to the ASX. Telfer is located within the NNW to NW trending, >1000 km long by 150 to 200 km wide Paterson Orogen (Fig. 1). This orogen is a >1000 km long by 75 to 125 km wide belt of metamorphosed sedimentary and igneous rocks that immediately fringes the northeastern margin of the Archean to Paleoproterozoic West Australian Craton, and merges with the Musgrave Orogen to the SE. It is composed of two main elements, the Rudall Complex and Yeneena Basin. The Rudall Complex comprises ~2015 to 1765 Ma Paleoproterozoic igneous and sedimentary rocks that were subjected to regional D1 and D2 deformation, metamorphism to granulite facies and granitic intrusion during the ~1800 Ma Yapungku Orogeny, followed by voluminous post-orogenic 1590 to 1310 Ma granitic intrusions only subjected to greenschist facies metamorphism. The complex also includes a domain of sheared peridotite, gabbro, pelitic schist and metaturbidites to the south and east (Bagas, 2004; Whitaker et al., 2010). The >24 000 km2 Yeneena Basin contains unconformably overlying Neoproterozoic marine sedimentary rocks of the ~9 to 13 km thick Yeneena Supergroup. It represents the extensional, fault controlled, northwestern extremity of the ~2 million km2 Centralian Super-basin, developed where the latter encroached upon the Paterson Orogen. The Yeneena Supergroup is the thickest measured section in the entire super-basin, but only represents the first of four super-sequences contained therein. To the west and SW, it is in fault contact with both stratigraphically equivalent and younger rocks of the Officer Basin section of the Centralian Superbasin that lap onto the West Australian Craton. To the northeast, the Yeneena Basin and Rudall Complex are overlain by the extensive Phanerozoic Canning Basin (Huston et al., 2010). The Yeneena Supergroup is composed of the Throssell Range and overlying Lamil groups. The Throssell Range Group is mainly exposed to the SW of Telfer, although similar rocks to the NE may be equivalents (Fig. 1). The lowest unit is the up to 4000 m thick Coolbro Sandstone, predominantly composed of grey, massive and thickly bedded fine- to coarse-grained sandstone. It is conformably overlain by the up to 3000 m thick Broadhurst Formation, a succession of interbedded fine to coarse sandstone to silty shale, including units of dark grey to black carbonaceous siltstone to shale with up to 10% pyrite and pyrrhotite, and stromatolitic dolostone. This unit hosts the ~810 to 790 Ma Nifty and Maroochydore stratabound, sediment-hosted, quartz-dolomite-sulphide vein network copper deposits, 70 km west and 60 km SSW of Telfer respectively. The Throssell Range Group is structurally overlain by the Isdell Formation, an ~1000 m shelf sequence of fine grained, thinly bedded carbonate rocks, calcareous siltstone, minor shale and local sulphidic dark grey or pale grey-cream carbonate rocks with lesser sandstone. This sequence is conformably overlain by the Lamil Group, which has only been subjected to greenschist facies metamorphism. It comprises a shallow marine sequence, divided into the Malu, Puntapunta and Wilki formations. The Malu Formation, the principal host to ore at Telfer, is up to 2000 m of thickly bedded, fine to medium grained quartzite and quartz sandstone with occasional thin interbeds of siltstone and mudstone. It has a transitional upper boundary with the Puntapunta Formation, 1500 m of laminated to thinly bedded dark grey dolomitic sandstone, dolomitic siltstone, chert, shale and limestone. The Wilki Formation, the uppermost unit of the Lamil Group, consists of up to 1400 m of silicified sandstone and minor shale. A suite of highly fractionated, I-type granite bodies, the Mount Crofton, Minyari, Wilki and O'Callaghans granites, intrude the Lamil Group (Fig. 1). The first three are oxidised, temporally progressing from strongly to more weakly magnetite-bearing granites, emplaced between ~645 and 630 Ma, whereas the 605 Ma O'Callaghans Granite is reduced and ilmenite-bearing (Czarnota et al., 2009; Maidment, et al., 2010). Although no granites are exposed within 5 km of the Telfer deposit, modeling of gravity data suggests large concealed intrusions, including the O'Callaghans Granite, extend beneath Telfer (Schindler et al., 2016). The latter is closely associated with the O'Callaghans scheelite-wolframite skarn altered deposit (Inferred resource of 69 Mt @ 0.34% WO3, 0.55% Zn, 0.27% Pb, 0.29% Cu). Deposition of the Yeneena Supergroup took place during an ~850 to 824 Ma, NE-SW directed extensional event. Related mafic to intermediate intrusions have been dated at 837 to 815 Ma. Yeneena Supergroup deposition was terminated by basin inversion during the Miles Orogeny between ~820 and 810 Ma (Huston et al., 2010). This event comprises two pulses of regional deformation overprinting the Paleoproterozoic D1 and D2 fabrics of the Rudall Complex. The first, D3, produced dextral strike-slip and reverse fault reactivation of the prominent NW to NNW trending extensional phase growth faults (e.g., Vines and Camel-Tabletop faults; Fig. 1), and recumbent folding in the Throssell Range Group. D4 was responsible for broad folds, conjugate faulting and greenschist facies metamorphism. A progressive 15° anti-clockwise rotation from NNW D3 to NW D4 axes resulted in a series of domal structures, including the Telfer Dome (Bagas, 2004). Widespread mafic dykes and sills were intruded between 750 and 700 Ma, followed by extensive 645 to 605 Ma granitic intrusion. The subsequent Paterson Orogeny involved early D5 open folds and a late D6 episode of NW trending dextral and ENE striking sinistral faults (e.g., Parallel Range and McKay faults; Fig. 1B) at ~550-540 Ma (Maidment, et al., 2010). Malu Quartzite - up to 1000 m of mainly massive and uniform metamorphosed quartz sandstone with increasing quantities of pelitic interbeds at both the top and bottom, indicating gradational contacts with the Isdell and Telfer Formations respectively. Much of the quartzite is pyritic and stratabound quartz veins are locally gossanous. • Lower Vale Siltstone, 2 to 5 m thick - thinly bedded and silicified siltstone with disseminated pyrite and siderite. • Footwall Sandstone, 20 to 50 m thick - commonly poorly sorted quartz sandstone. • Middle Vale Siltstone, 5 to 9 m thick - fine grained and thin bedded argillaceous siltstone, claystone, mudstone, minor carbonaceous limestone and calcareous sandstone. It is pyritic and the main ore host in the original Telfer open pits hosting the Middle Vale Reef. Abundant shortite pseudomorphs are evident in this unit. • Median Sandstone, 25 to 40 m thick - poorly stratified and thick bedded, fine grained and well sorted quartz sandstone with silty or muddy interbeds. • Upper Vale Siltstone, 1 to 4 m thick - thinly bedded sideritic siltstone with minor fine grained sandstones, containing disseminated pyrite in places. • Rim Sandstone, 30 to 40 m thick - a stratified sequence of interbedded quartz sandstone to subarkose and argillaceous siltstone. • Outer Siltstone, up to 500 m thick - well stratified, thin bedded, argillaceous, calcareous and minor carbonaceous siltstones with interbedded sandstone. The lower sections host the 'E Reefs' at Telfer. In the Karakutikati Ranges this unit has laminated dolomite and dolomitic shale prominent near the top. Within the Telfer Dome, this succession has been folded into two asymmetric, en echelon, doubly-plunging anticlines, the Main and West domes, separated by a tight faulted syncline (Fig. 2). Both domes have shallow to moderately dipping western and moderate to steep eastern limbs indicating NE vergence in a NE-SW directed compressive stress field during D3 folding. This is the first regional deformation evident at Telfer, and resulted in well-developed cleavage, parallel, or at a low angle, to bedding. This fabric is crenulated by a steeply SW dipping axial plane cleavage. The former is the result of bedding plane slip/shearing during folding, with total displacements of <10 m (Vearncombe and Hill, 1993). This bedding plane slip was strongly partitioned within more ductile siltstone beds and along competence-contrasting sandstone-siltstone contacts. In addition to the folding, shallow NE vergent thrusts formed. Five monocline-anticline structures have been superimposed on the two domes. Each strikes north-south, and is doubly plunging, with axial planes dipping at 35 to 50°W. They are typically up to 1 km in length and 50 to 200 m wide, often with steep east limbs that are locally overturned. A third, weakly developed, ENE trending cleavage, which dips either to the SSE or NNW, is likely related to D4. • Bedding-concordant veins, locally termed 'reefs', that are laterally extensive over lengths of up to 1 km or more, both laterally and down dip, and are 0.1 to 10 m, averaging between 0.3 and 0.7 m thick. These reefs follow D3 bedding plane slip shear structures. In the hypogene zone, reefs are composed of quartz±dolomite with sulphide and gold, and traces of scheelite, carrying grades of between 5 and >50 g/t Au, and 0.2 to 1.5% Cu. Average reef grades are frequently >10 g/t Au. The proportion of quartz, dolomite and sulphides is variable, ranging from as much as 80% quartz, to dominantly sulphides within sericite-pyrite shear planes. There is a tendency for a higher proportion of dolomite in the lower reefs, which may be pink, grey or white. A total of 21 reef structures have been identified within the Main Dome, distributed over a stratigraphic thickness of ~1000 m, occurring as either single reefs of sheeted clusters of closely spaced veins. The main upper reefs, the E and Middle Vale reefs, hosted by the basal Outer and Middle Vale siltstones respectively, are planar sheets with surface areas of up to 20 km2, the latter of which averages 1 m in thickness, but ranges up to 3 m. These two reefs extend from the southern Main to the Western Dome. However, Reefs below the Middle Vale are less extensive, and are best developed in the anticlinal crest of the Main Dome, tapering on the flanks of the structure. The next significant vein, the M10, which is 100 m below the Middle Vale Reef in the Upper Malu Member, has a north-south strike length of 2 km and 500 m dip extent, mostly on the eastern flank of the dome. It averages 0.45 m in thickness, ranging from 0.1 on the flanks to 2 m in the axial zone. This is a member of the M-Reefs that are distributed over intervals of <10 to >150 m within the Upper Malu Member. Other M-Reefs illustrate the variation in reef characteristics. The M40 reef, 250 m below M10, is 0.2 to 0.6 m thick carrying 5 to 80, averaging 16 g/t Au, hosted within the Upper Limey Unit which has undergone strong carbonate alteration. The M45 reef, which is 25 m lower, is generally ~2 m thick, and occurs as either a sericite-pyrite shear plane or a quartz-dolomite-sulphide reef, with grade that are typically <10 g/t Au and <1% Cu. 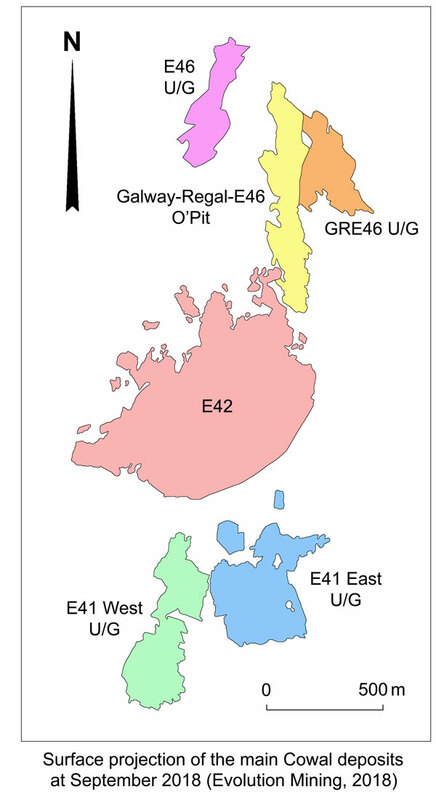 The M50 reef, which is 25 m lower, and 300 m below M10, is composed of three separate bands. The upper of these averages 0.2 m in thickness and comprises disseminated sulphides, fine white dolomite and pyrite-chalcopyrite veins within a black, fine- to medium-grained carbonaceous siltstone, carrying 6.4 and 3 g/t Au respectively above and below the base of oxidation. The middle section is a 0.1 to 2.0 m thick quartz-dolomite-sulphide reef as described in other positions, with grades varying between 5 and 94, but averaging 34.6 g/t Au. The lowest band is a 0.2 to 0.5 m thick calcareous sandstone. The A-Reef set is developed within the lower two thirds of the Middle Malu Member, being most densely packed at the base where they may be only a few metres apart, becoming more widely spaced upwards. The most significant in the lower part of the sequence is the I30 Quartz Reef at the contact of the Middle Malu Member and the Lower Limey Unit. It has an area of 875 x 160 m, elongated north south following the crest of the Main Dome, where it is 10 m thick, tapering to ~0.5 m on the flanks of the fold. Mineralisation is dominantly pyrite and chalcopyrite with a gangue of quartz, grey, white and pink dolomite, calcite and rare siderite. The geometry of this reef is controlled by the intersection of the I30 monoclinal fold, a north-south striking reverse fault and a near vertical NE trending fault corridor. The lowest concordant vein set, the B-Reefs, occur as a cluster in the top 75 m of the Lower Malu Member. • Veins that are discordant to lithological boundaries, within the axial core of the domes, trending either NE and dipping ~45°NW, or ENE with steep NNW or SSE dips. The former comprise quartz-carbonate-sulphide-gold, and the latter carbonate-quartz-sulphide-gold, with gold and copper grades similar to the reefs. Both contain traces of scheelite. The carbonate is a pink to grey dolomite with minor calcite. • Breccia and stockwork veining, which forms the bulk of the sulphide resource. Stockwork veins are narrow and discontinuous, cutting across stratigraphy, and are composed of dolomite-quartz-sulphide-gold, forming zones that are characterised by consistent grades of >0.3 g/t Au. The breccias consist of wall rock clasts in a matrix of dolomite-quartz-sulphide-gold. Stockwork mineralisation envelopes and links concordant reefs to form halos with a thickness from a few to as much as 200 m perpendicular to the reefs, with lateral continuities of 100 to 1500 m. These halos are best developed in the axes of the main domes, and pass outwards into patchy zones and pods of stockwork mineralisation. The other principal occurrence is as large, gently SE plunging elongate zones that follow the axial traces of monoclinal structures, and are not closely linked to the main concordant reefs, although intersecting reefs are locally enriched. Underground mapping shows mutually crosscutting relationship between the different vein types, suggesting several pulses of hydrothermal activity forming alternating reefs, discordant and stockwork veins. The metasedimentary rocks hoating these veins have all been affected by sericitisation, silicification, and lesser carbonate (calcite-dolomite) and tourmaline replacement, which is most intensely developed immediately around the veins and breccias. Sericite-carbonate alteration is most pronounced in argillaceous and carbonate hosts, while silicification is strongest in quartz-rich arenites (Schindler et al., 2016). Hypogene sulphides are predominantly pyrite and chalcopyrite, with lesser chalcocite and bornite, minor cobaltite and nickel-sulphide. They occur as disseminations and locally as massive zones in quartz and quartz-carbonate veins, and as disseminated blebs and euhedral pyrite crystals replacing sedimentary hosts. Two phases of pyrite growth are recognised. The first is rare subrounded and rounded aggregates of fine euhedral pyrite, possibly of diagenetic origin. It occurs in a thin laminated interval at the top of the Middle Vale Reef, and is overgrown by the dominant coarse-grained subhedral to euhedral epigenetic pyrite found throughout the deposit. Primary gold occurs as free grains on boundaries and crack infill of pyrite and chalcopyrite, in the lattice of pyrite, as Au telluride (calaverite) or Au-Ag telluride (sylvanite), or as electrum inclusions in pyrite, and to a minor degree on gangue silica grains. There is a correlation between vein frequency and gold grade. The deposit has been oxidised to depths of from 80 up to 200 m, with an irregular oxide to hypogene boundary, sections of which are occupied by a well-developed supergene enrichment zone. The modern static water table is ~80 m below the surface, and the base of the supergene sulphide zone is at a depth of ~240 to 290 m. Oxidation of primary sulphides to boxwork textured goethite, hematite and other iron oxides is complete throughout the weathered profile, accompanied by variable amounts of vein quartz and clay minerals. Other minerals include monazite, xenotime, magnetite, cuprite, covellite, rutile and zircon. Only minor enrichment of gold appears to have occurred in the oxide zone, although there has been almost total depletion of copper. Minor redistribution of gold occurred near surface with the growth of small nuggets and wire gold in shallow gossans. In addition, erosion of the reefs produced a pediment of alluvial gold in pisolitic laterite and gravels distributed irregularly along the eastern flank of the Main Dome (Dimo, 1990). The supergene enriched zone contains a complex assemblage of secondary oxide and sulphide minerals, including chalcocite, bornite, chrysocolla, cuprite, tenorite and malachite plus remnant native gold. This ore has similar textures and appearance to the hypogene mineralisation, except that chalcocite has extensively replaced pyrite along grain boundaries and fractures in the supergene zone. On the northeastern flank of the Main Dome, supergene and mixed supergene-oxide ores averaged 27 to 29 g/t Au and 2 to 10 wt.% Cu, whilst the underlying hypogene reef contained 1.6 to 12.8 g/t Au and up to 0.1 wt.% Cu (Dimo, 1990). Hypogene mineralisation at Telfer post-dates D3 cleavage, as indicated by its control on veining and by euhedral pyrite replacement of minerals forming the cleavage fabric (Rowins et al., 1997). Limits on the age of this deformation event are indicated at the Nifty copper deposit, where mineralisation dated at between 810 and 790 Ma also post-dates D3 cleavage. Monazite and xenotime from Au-bearing concordant and discordant veins at Telfer have been dated at 652±7 and 645±7 Ma respectively, closely coinciding with ages of the oxidised, magnetite-bearing granitic rocks widespread within the district and indicated in gravity data to underlie the deposit at depth (Maidment et al., 2010; Schindler et al., 2016). Fluid inclusions from the various vein types contain five fluid assemblages, with trapping pressures calculated to vary from 3 to <1.5 kbar, homogenisation temperatures of from >480 to <150°C and a mix of salinities from fluids with ~50 and a second suite with 21 to 54 wt.% NaCl equiv.. Other data indicate reduced fluids dominated the system. Fluid inclusions also suggest the three vein types formed from a similar fluid with any vein composition variation reflecting reactions with differing host lithologies. The higher trapping pressure ranges measured exceed calculated lithostatic pressure at the estimated ~5 km paleodepth of the deposit at the time of formation, suggesting the ore fluids were over-pressured (Schindler et al., 2016). This is supported by the vein-fault geometry within the deposit which also demonstrates overpressuring. Goellnicht et al. (1989) and Schindler et al. (2016) suggest the high content of major elements (Na, Mg, K, Ca, Fe, Mn, Cu, Zn, Pb, Co, Ni, Ag, Ce, La, Y and Mo),and high homogenisation temperatures in all fluid inclusion assemblages are compatible with involvement of a magmatic hydrothermal fluid. However, Rowins et al. (1997) present C, O, B, Pb and S isotope data from both ore sulphides and alteration minerals (carbonates and tourmaline) they interpret to indicate ore fluid solutes were derived from sedimentary rocks of the Yeneena Supergroup. On the basis of these observations, it is postulated metal-bearing magmatic fluids were released into the permeable sedimentary rocks of the Lamil Group, sourced from the large composite granitic body indicated to underlie the district and deposit (Goellnicht et al., 1989; Schindler et al., 2016). These mingled with basinal brines, to be circulated in thermal convection cells, driven by the magmatic heat source, scavenging additional solutes from the host sequence (Rowins et al., 1997). The high temperature, over-pressured hydrothermal fluids collected in the crests of the pre-existing D3-4 Main and West domes, where they permeated bedding plane shears below fine grained aquitards, to hydraulically delaminate and inflate the sequence. 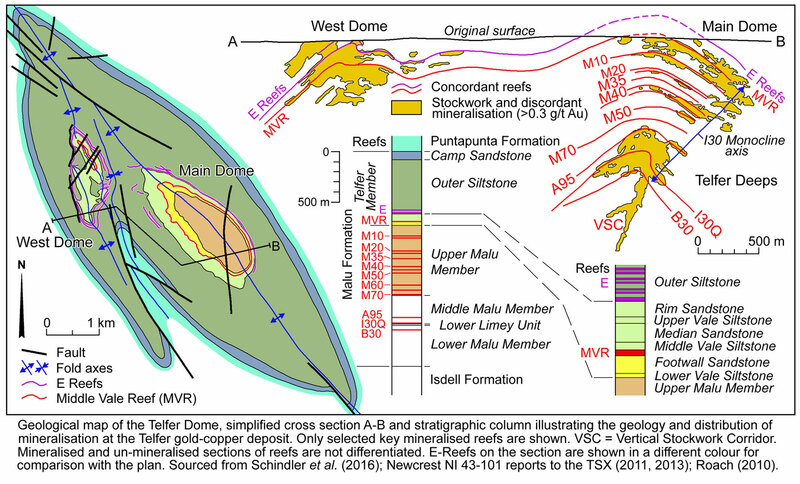 During this process, Vearncombe and Hill (1993) estimate that in the Middle Vale Reef, ~40% of the matrix of the siltstone in the shear zone was dissolved and removed. Periodic over-pressure induced fault failure led to sharp pressure release, adiabatic cooling and precipitation of gold, copper, silica and dolomite to form the concordant reefs. The preceding asymmetric NE vergent D3-4 deformation had both enhanced dilation in the bedding plane shears and preferentially fractured competent sandstones on the steeper northeastern limbs of the domal structures. This acted as ground preparation, facilitating access of fluids and providing sites for deposition of the bulk of the concordant, crosscutting vein and stockwork ore. Mineralisation is, in general, best developed in areas of the greatest structural complexity (Schindler et al., 2016). In 1988 reserves + production accounted for 146 t Au at an average grade of 2.35 g/t Au. underground resources were 3.9 Mt @ 11 g/t (indicated) + 7.5 Mt @ 6 g/t Au (inferred). In 1997, the total measured + indicated + inferred resource was - 173 Mt @ 1.4 g/t Au. The original mine operated from 1975 to 2000, over which period it produced ~185 t of recovered gold mainly from oxide resources. The redeveloped operation commenced with two open pit mines (Main and West domes) in November 2004 and February 2005 respectively and underground (4 Mtpa) in February 2007 mainly exploiting sulphide ore. Total production from this second period had reached 188 t Au by December 31, 2017.
including Open pit - 444 Mt @1.39 g/t Au, 0.13% Cu; Underground 59 Mt @ 2.8 g/t Au, 0.52% Cu; plus satellites and stockpiles. Underground reserves: 46 Mt @ 1.3 g/t Au, 0.33% Cu for 59 t Au. TOTAL gold in reserves in June 2011 was 369 t.
Underground resources: 100 Mt @ 1.2 g/t Au, 0.31% Cu for 120 t Au. TOTAL gold in resources in June 2011 was 575 t.
Ore Reserves are included within Mineral Resources. Underground reserves: 19 Mt @ 1.4 g/t Au, 0.24% Cu for 26.6 t Au. TOTAL reserves: 127 Mt @ 0.77 g/t Au, 0.10% Cu for 98 t Au. TOTAL resources: 355 Mt @ 0.82 g/t Au, 0.14% Cu for 291 t Au. The summaries above were prepared by T M (Mike) Porter from a wide range of sources, both published and un-published. Most of these sources are listed on the "Tour Literature Collection", soon to be available from the OzGold 2011 Tour options page.